This project takes what others have done and combines them to create a DIY cost effective Infrared (anything IR) TV controller for Smartthings with Alexa support. It does something along the same lines as can be done with the Harmony hub. 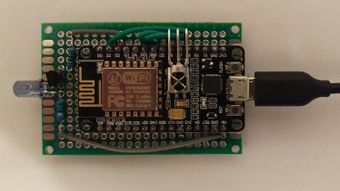 An ESP8266 NodeMCU WiFi unit with IR LED and IR receiver. This transmits the IR signals, the commands are sent locally from SmartThings via HTTP to the ESP webserver. Ask Alexa and webCoRE, Ask Alexa gets the instructions from Alexa, and through its Macro functionality calls webCoRE which executes a piston, which in turn, sends the local http request to the ESP8266. 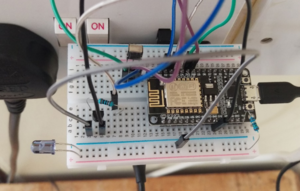 For the ESP8266 NodeMCU follow mdhiggins excellent writeup and implementation on it. Details can be found here - https://github.com/mdhiggins/ESP8266-HTTP-IR-Blaster. A couple of things to note when putting the hardware together. For the software side follow the instructions in the readme in mdhiggins repository, up to the point of doing any sort of port forwarding on your router and IFTTT. These steps are not needed here as Ask Alexa and webCoRE take care of communicating with the ESP8266. 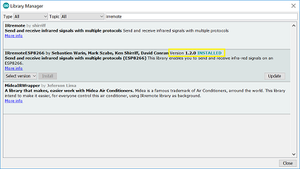 To install the ESP8266 Arduino Core, use the Board Managed installation process as described through the links in mdhiggins repository . Install the libraries as instructed. With the libraries installed install the mdhiggins IRController blueprint (it runs the web service and controls the IR transmitter and receiver) into the Arduino IDE. Blueprint available from the repository.Finally upload to your board. Keep an eye out for remotes that use 'address', and make sure it is included when sending codes back. Panasonic always do it seems. You may need to convert the address received from HEX to DEC when sending the code back, in the example above the address received from the remote was 0x4004, in DEC is 16388. Some trial and error may be required in this area to get the codes and format for sending back correct. If you encounter problems with any of the above and you are not sure if the IR LED is emitting, it is useful to point a smartphone camera at the LED when sending commands, it should it light up purple, use your TV remote to check your camera is picking up IR light first. Make sure you are using the latest versions of the above. This solution uses recently updated functionality with allows for the passing of parameters from the skill all the way to the Piston. Alexa/Echo sends commands to Ask Alexa via the Skill and the Lambda code (e.g. 'Alexa, Ask the 'Kitchen TV' to change the 'channel' to 'BBC ONE) - note 'Kitchen TV' is the skill invocation name, 'channel' is the macro name, and 'BBC ONE' is the parameter (LIST_OF_WCP). ESP transmits IR codes to TV. 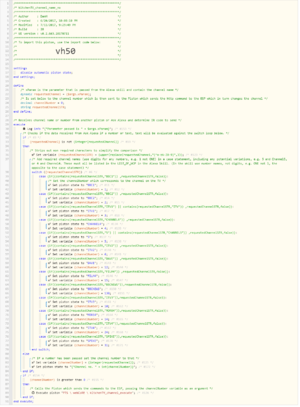 To ensure this all works it is recommended that you work backwards from the webCoRE piston. Included below is an export of the two pistons which deals with taking the request from Ask Alexa and sending the HTTP request to the ESP8266. The first Piston takes the xParam parameter and determines the channel sequence to send. For ease use the code in the image to import into webCoRE. The second piston receives the channel number from the fist, determines the code sequence and then sends the commands to the ESP. The Pistons are split in this way to ensure there is capacity to add other channels (there are some size limitations per piston). Make sure you update the case statements within this Piston to match your channel names and numbers. The channel names should match the LIST_OF_WCP entries that you will update later. Note the Piston strips out any special characters and spaces to reduce match requirements. Also, Alexa when hearing any numbers, passes them through as digits. For an example BBC One would be passed through in the xParam as BBC 1, it may also be passed as B.B.C. 1, but the Piston would cut this down to BBC1 for the case statement. Update the variables to match the codes of your TV, the codes in this Piston are for a Panasonic TV. If you configuration does not use the address variable you may need to exclude this from the final section of the piston which creates the HTTP request. Test the Piston to make sure it sends the commands. create a temporary Piston which calls the 'Channel name' piston, passing an xParam with a channel name as the argument. With the Piston saved and humming, create a Ask Alexa Macro to link to and execute the Piston. Open the Ask Alexa SmartApp from the SmartThings mobile app and under Ask Alexa Extensions, select Macros from the Installed extensions section. Select ‘Create a New Macro’ and give it a name. The name here is important as it is what you will ask Alexa. For this example the Macro name is 'Channel' (Alexa, Ask the 'Kitchen TV' to change the 'Channel' to 'BBC ONE'). This needs to be unique. 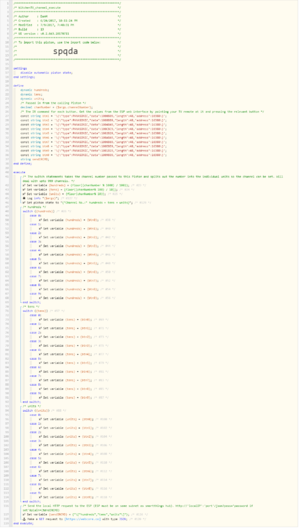 Specify the Macro Type as webCoRE, and select the Piston you just created. The Advanced features configuration section allows you to manage acknowledgement messages and if you require the additional parameter. If you are specifying a custom acknowledgement you can include '%xParam%' (as written here) within the text and Ask Alexa will add in the additional parameter it received as part of the acknowledgement message. Selecting 'Require Additional Parameter to Run Macro' will stop the macros executing its action if the additional parameter (xParam) is not received from Alexa. If you have specified you require the additional parameter you can also supply a custom acknowledgement message when the parameter is not received from Alexa. The final step is to tell Alexa about the Macro. Click Edit (as highlighted above), add in the name of the Macro as you created in the Ask Alexa config You will see from the image a number of Macros exist, the primary macro being Channel in this example. Make sure what you have in this list matches what you have in the Ask Alexa app, refer to the links at the end of this article for full details of populating these slots.. Finally edit the LIST_OF_WCP and add in the parameters (in this example the TV channel names). Included below is an example list of channel names and numbers. If you add or change the channel names, make sure you add/edit in the associated case statement in the Channel Piston (as described above). Make sure you click Update on both sections when you have updated, finally scroll down to the bottom of the page and click Save. Ask Alexa - Custom Slot Information and Ask Alexa - Setup Variables. You should now be able to say... ‘Alexa, ask the Kitchen TV to change the channel to BBC one’. Note, in this example the Skill Invocation Name is 'Kitchen TV'. If you want to repeat this for another room, simply create another instance of the skill and repeat above, set a different Invocation Name - see Multi Name Control for details about setting up multi room configurations. In the list below where any items are likely to be interpreted as abbreviations use '.' and 'spaces' to spell it, Alexa seems to matche more in this format than without. Repeat the item in question without the special characters to help ensure a match, e.g. 'BBC ONE' 'B. B. C. ONE'. Spell out numbers rather than using digits. To cover all channel numbers expand your list as required.